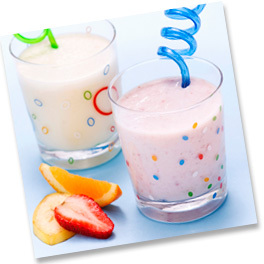 Welcome the back-to-school season with this fun after-school snack. Kids will enjoy making this jiggly treat and parents will love it too because it's made with fresh fruit and 100% fruit juice. POUR 1 cup Juicy Juice into large bowl; sprinkle with gelatin. Pour remaining 4 cups Juicy Juice into medium saucepan; bring just to a boil over medium-high heat. Pour into bowl with gelatin; stir until gelatin is completely dissolved. According to a recent "Snack Survey," nearly 90 percent of parents are concerned about both nutrition and good taste when choosing snacks for their kids. With its blend of kid favorites--from pretzels to dried fruit to NESTLÉ RAISINETS--this recipe offers a deliciously nutritious option. 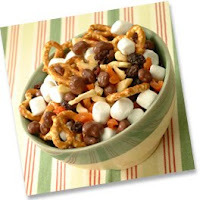 COMBINE Raisinets, pretzels, marshmallows, raisins, apricots and apples in large bowl. NOTE: Any variety of Raisinets can be substituted. PLACE water, dry milk, sweetened condensed milk, strawberries, ice and banana in blender; cover. Blend until smooth.